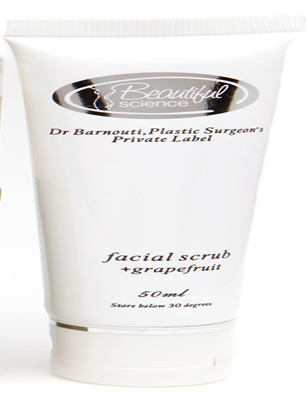 Beautiful Science® “Facial Scrub + Grapefruit” is suitable for all skin types with smooth micro-beads,gently cleanses and effectively exfoliates dead skin cells,which helps to regenerate healthy cells.The structure of a scrub does not irritate the skin and does not hurt (the balance of the skin is not broken). 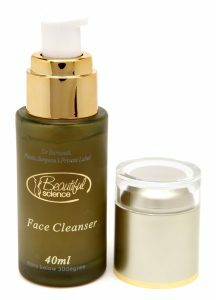 It deeply cleans pores and removes black dots in the T-zone, restores the protective and regenerative functions of the skin, refreshes and leaves skin smooth and even improves the complexion. Grapefruit juice is effective and is the gentlest way to whiten skin. Grapefruit oil has anti-cellulite effect, cleanses and tones the skin, strengthens the immune system, improves metabolism. Grapefruit aroma charges vitality. De-ionised water, glyceryl monostearate, cetyl alcohol, polysorbate 60, paraffin liquid light, paraffin soft white, pumice, calcium carbonates (crushed lime and sandstone), rose oil, Melaleuca alternifolia oil, Grapefruitoil, phenoxy ethanol, methyl ethyl propyl butyl parabens, octhilinone. Apply thinly to face and neck. With moist fingertips, massage gently into the skin around the mouth, nose, forehead and chin areas. Rinse with lukewarm water. Follow with appropriate toner and moisturizer Eliminates impurities, stimulates the building of new epidermis cells and removes dead cell build-up. Use regularly.